All content posted to North Korea’s YouTube, Twitter, and Facebook pages were in Korean without any English subtitles. Most of the postings were previously released propaganda material taken from DPRK official media outlets, such as Pyongyang television, KCNA, Rodong Sinmun, and Uriminjokkkiri (UMK). YouTube was the first international networking site where North Korea began posting propaganda material in July. UMK set up its own YouTube channel (http://www.youtube.com/user/uriminzokkiri) on 14 July. Its initial postings between 14 July and 11 August were mostly UMK produced video statements disparaging South Korea and its government, and claiming that the DPRK was not responsible for the sinking of the ROK naval vessel Ch’o’nan [Cheonan]. Between 12 and 25 August, however, the overarching theme of the postings shifted to introducing North Korea’s culture, landmarks, social system, and economy. Most of these clips were taken directly from Pyongyang television. As of 31 August, the ROK Government has blocked South Koreans’ access to the UMK YouTube channel’s profile page. However, South Koreans can still access its video clips by searching on the YouTube main page. UMK opened its Twitter account (http://twitter.com/uriminzok) on 12 August. Most of UMK “tweets” were titles and links to existing official DPRK media reports from KCNA, Rodong Sinmun, and UMK. The news reports describe Kim Jong Il [Kim Cho’ng-il]’s activities and various domestic and international events. The majority of articles denounce the United States, Japan or South Korea. The UMK Twitter page also hosted some links to video clips on its YouTube channel, and a few cartoons taken from the UMK website satirizing South Korea’s political situation. The only unique messages were two announcements: a self-introductory “tweet” on 12 August stating that “This is the UMK website’s Twitter account”; and another “tweet” on 23 August announcing the opening of a UMK Facebook account. 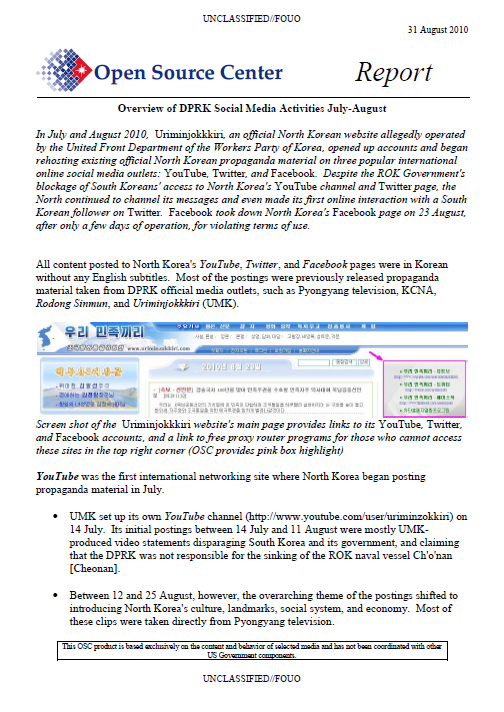 On 19 August, the ROK Government blocked access to the UMK Twitter site. However, South Koreans were still able to read Twitter messages via smartphones. On 28 August, UMK conducted its first interaction with a South Korean follower on Twitter by replying to the follower’s question about the DPRK’s YouTube channel.